In 2010, SSgt Micky Yule was serving in Afghanistan as a Royal Engineer Search Advisor. This high risk role involved counter IED detection and training. On July 1st, only eight weeks into his tour, he stood on a pressure plate IED; as a result of the blast Micky lost both legs, suffered a shattered pelvis, fractured arm amongst other internal injuries. He was flown back from Helmand Province to Selly Oak Hospital in Birmingham. His injuries required many operations. However, determined Micky was already making plans for his future and less than a year later he walked down the aisle on full length prosthetic legs when he married his partner Jody. He also began to seriously compete in weightlifting with the aim of competing at an international level in the GB Power-lifting Team. In order to progress with this goal and his physical rehabilitation, Micky needed weights and other equipment so he could train at home. The Soldiers’ Charity gave him an immediate grant for the purchase of this kit. He told us: ‘It was a godsend and the actual quality of the weights I was given are just brilliant; they’re the same kind that the guys use at the Olympics so it’s top notch kit’. ‘The support we’ve had has been great, it’s enabled us to push on and get back to normal life’. We were also there to support Micky’s wife Jody in her future career aspirations. Jody had originally given up her job to look after her husband during his recovery but now wanted to make jewellery. The Soldiers’ Charity administered a grant to cover the cost of a ceramics course so that Jody had the necessary skills for this career change. Jody says ‘The support we’ve had has been great, it’s enabled us to push on and get back to normal life’. 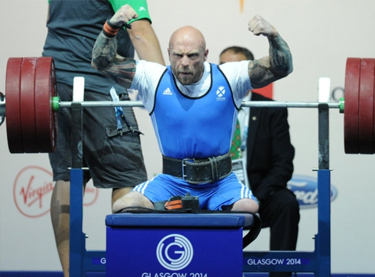 Micky won a powerlifting gold at the 2016 Invictus Games in Orlando. He was selected for the GB Paralympics Team and competed in Rio, finishing in sixth place in the men’s 65kg powerlifting competition – an excellent achievement. He was also our Ambassador for the 2016 Cateran Yomp. Micky achieved another credible 4th place representing Scotland at the 2018 Commonwealth Games in Heavyweight Para Powerlifting. Help us continue our vital work in supporting former soldiers like Micky by making a donation today.